Buddhism can be seen as a tree with one trunk and many branches and roots, the trunk symbolising the essential spiritual teachings, and the many branches symbolising the different traditions which have grown from that trunk to meet the needs of different cultures and individuals. For understanding the relationship between Buddhism and the arts, it is helpful to have a basic knowledge and understanding of some of Buddha’s teachings, particularly the 4 Noble Truths, the Noble Eightfold Path, the Vinaya and the different schools of Buddhism and their location. The truth of suffering (dukkha): we all suffer physically and mentally to a greater or lesser extent eg birth, old age, sickness, death, getting what we don’t want, not being able to get what we do want and associated emotional pain of lust, anger, hatred, pride, envy, sadness, stress and so on. The path leading to the cessation of suffering: training in the path that leads to lasting happiness. This is the Noble Eightfold Path – right view, right thinking, right speech, right action, right effort, right mindfulness, right concentration, right livelihood. ‘Right’ in this sense means what is beneficial. Looking deeply into the nature of suffering, the Buddha saw its cause and discovered that when suffering and delusion dissolves, the enlightened nature of mind present in all sentient beings is revealed, rather in the way the open, bright, spacious sky is revealed when clouds disperse. For Buddhists, enlightenment involves uncovering something already within one, rather than actively creating something new or searching for something outside of oneself, and anyone can realise this state with motivation, perseverance and training. It is a process of becoming aware of and letting go of one’s own ignorance, aggression, greed, pride and jealousy to reveal what has naturally been there – but concealed - all along: the compassionate, blissful, awake, knowing, empty essence of mind inherent in all living beings. Central to this are teachings on the nature of mind and phenomena which include emptiness, impermanence and interdependence: very subtle and easily misunderstood topics where it is easy to go astray. Buddha constantly admonished his followers to not take his word for granted, but to investigate his teachings for themselves, so Buddhists need to study the teachings and learn meditation from realised teachers in order to gain a correct understanding, experience and realisation of these subjects. This includes training in the Noble Eightfold Path, which is the foundation for the Buddhist way of life, the basics of which are to avoid negative actions, practise positive actions and to tame the mind. Deeply understanding the Four Noble Truths. Right view is the basis for right thinking, right speech and right action. Speaking truthfully, avoiding shouting, slandering, or speaking in a way which causes hatred or suffering, not exaggerating, not being divisive. Has to be informed by Right Thinking. This means our many actions of the body. Informed by Right View, this involves practising loving kindness and compassion towards ourselves and others, and avoiding intentionally harming ourselves or others, including animals. A vast range of practices are included here including generosity, sexual responsibility, being mindful about what we eat, drink and consume, not killing or stealing. This is the effort that Buddhists put into realising the Noble Eightfold Path. Rather than putting effort into acquiring wealth or fame, which do not permanently alleviate suffering, Buddhists put effort into joyfully nurturing their practice. In some traditions there is a crossover; for example the Tibetan tradition includes Theravada, Mahayana and Vajrayana practices of the Eightfold Path within its tradition. It is important to remember that all traditions agree upon the essential teachings of the Buddha, even though outer forms of practice may differ. The Vinaya are the teachings of the Buddha on how monks, nuns and laypeople should conduct themselves. The specific rules which Buddhists would follow regarding behaviour depend on which sets of vows they have or have not taken. This could vary from 3 vows for a layperson holding basic Refuge vows to over 250 vows for a fully ordained monk or nun. For example, some Buddhists have taken a vow not to drink alcohol, while others have not taken this vow. Monks and nuns are not permitted to sing and dance in a secular context, but some do take part in performances involving religious dance, chant and sand mandala. Buddhism offers many training methods, including the arts, for guiding individuals towards enlightenment, and all traditional Buddhist arts are intended to be reminders and inspiration pointing the individual towards the ultimate nature of phenomena and the ultimate nature of mind. Buddha images and other Buddhist art showing, for example, the life of the Buddha, also serve educational purposes in areas of low literacy, helping people to understand the teachings and reducing suffering. Many people who make Buddhist art regard it as a spiritual practice, for in order to make truly sublime work, it helps if one meditates and has the right view and intention from the outset. The aim of Buddhist art is to inspire and remind: a Buddhist artist practising the Eightfold path would be aiming to express the qualities of the enlightened mind through their work, with no interest in personal fame or originality for its own sake, as this would be counter to Buddhist practice. 1. Traditional Buddhist art forms made to complement and enhance traditional practices found in temples, monasteries, centres, hermitages, the home and places of retreat. These art forms are still practised and can include wall and scroll paintings, sculpture, carvings, textiles, hand crafted ritual implements, illustrated sacred texts and poetry. Traditional paintings and statues of Buddha, bodhisattvas and principal or revered teachers are made to iconometric proportions in some traditions such as the Tibetan, while in others, such as Zen, the traditional forms are more freely interpreted. Wood, metal and clay are often used to make ritual or sacred objects. More recently, photography has been used to make inspirational records of pilgrimage sites and principal teachers. From its origins until 1st Century CE there are no found representations of the Buddha, although there are surviving early symbols of the Buddha and Buddhist teachings (Buddhadharma) such as pillars decorated with Buddhist symbols, stupas and sculptures representing Buddha’s life. Buddhist art continues to be full of symbolism including the Stupa, 8 auspicious symbols, lotus, footprints of the Buddha, Vajra and Bell, light, Bodhi tree, empty throne, columns, lions, mudras (hand gestures), deer, 5 elements. From around 1st Century CE statues of Buddha were made in Pakistan and central Northern India, and China, where a rich and creative heritage of sculpture and painting developed. Vietnamese Art shows a strong Chinese influence. Japan was introduced to Buddhism in the 6th Century. From the 12th Century Zen art, which considered almost any human activity as spiritual, produced art in many forms including Sumi-ye painting, haiku poetry (which although not Zen literature, has nevertheless been influenced by Zen ), calligraphy, pottery, ikebana (art of flower arrangement), gardening and later on, the Tea Ceremony. Tibet, where Buddhism arrived in 8th Century, whose best known art forms include Thangkha Painting and statuary. Other arts forms include butter sculpture for ritual use, painted and sand mandalas, masks, prayer wheels, metal and wood craftwork, sculpture, poetry. From 1st to 7th Centuries Thai Buddhist painting and sculpture were influenced by India, following which Cambodia Khmer and Sri Vijaya, both Mahayana, were the main influences. Sri Lanka has produced some magnificent statuary. Paintings on cloth, wood and murals on temple walls, often served an educational purpose by showing stories from the life of the Buddha and his teachings. There is a long tradition of practitioners expressing their realisations and teaching others through spontaneous song, dance and painting which may or may not have a traditional form. For example in India there was a tradition of masters such as Saraha singing spontaneous songs (dohas) of realisation, often as a teaching to a student, and in Tibet the yogi Milarepa was famous for his ‘Hundred Thousand Songs’ which he sang to teach nomads, farmers, monastics and yogis as well and to express his own realisations. Contemporary artists may use traditional or contemporary forms separately or in combination eg film/sculpture/painting used together in an installation piece. While there may be a deeply felt spiritual context to the work, it would not necessarily be intended to go in a monastery, centre or temple and would not have to be made according to iconometric recommendations. Buddhism was introduced to Europe and the USA in the 19th Century, with most traditions and their arts now being represented. Many well known western artists in the past century have been influenced by Buddhism; this has been recently documented in a book by Jacquelynn Baas and Mary Jane Jacob. While in the USA there is a strong culture of contemporary Buddhist art due to the influence of Zen and the Beat generation in the last century and more recently, Vajrayana Buddhism, contemporary Buddhist art is just emerging in the UK. There are over 151,816 Buddhists in the UK from culturally and racially diverse backgrounds and Buddhist organisations from all traditions ie Theravada, Mahayana and Vajrayana, all of which welcome people from all ethnic and cultural backgrounds. It is important not to confuse the Buddhist spiritual path with a particular culture. As mentioned earlier, the culture may influence practices and outer forms, but the essential teachings are the same, regardless of culture. Please see appendix 1 for contact details. Many contemporary artists also use themes such as impermanence, delusion, interdependence, compassion commonly studied in Buddhadharma, and may feel a link with Buddhist ideas without necessarily calling themselves Buddhist. The only access we have to ancient Buddhist music is through what we hear now through Sri Lankan, South East Asian, Himalayan, Central Asian and East Asian Buddhist musical traditions. Monks and nuns were not allowed to play instruments, dance or sing in a secular context, but could chant sacred texts such as the Paritta-suttas in Pali which “form part of a daily chanting ritual in Theravada Buddhism dating back to 3rd Century BCE…another ancient Buddhist musical tradition is the Newari traditions of the Kathmandu valley. Music, text, poetry, song and dance are often used as part of ritual. Some monasteries hold sacred performance by monks or teachers wearing costumes or masks, for example Vajrayana Cham Dance in Tibet. In Korea, "Sungmu", or the Monk's Dance, brings together colour, music and movement. Texts and visual art refer to playing wind, percussion and some stringed instruments. “The followers of later Mahayana Buddhism seem to have begun to make use of theatre and dance probably from the 1st century AD. 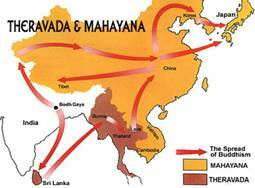 Satiputra-prakarana, the first Buddhist play written by Ashvaghosa, a Buddhist poet of 1st-2nd century CE suggests the existence of Buddhist theatre in ancient India”. Japanese Zen Theatre includes Noh Drama, and Zen music is primarily composed of utai or singing and hayashi or orchestra. Shakuhachi is primarily an open, vertical flute which is extremely difficult to play producing an incredible variety of timbre and pitch gradation. As with visual art, there is a wide range of contemporary Buddhist and Buddhist influenced performing artists in theatre, film, music, dance and performance art by both emerging and well known artists. All Buddhist images, artefacts and texts were made for spiritual purposes. It can be offensive to mistreat them and they should be shown respect. However, how this is interpreted can be confusing, as different cultures have varying traditions for the respectful treatment of Buddhist images, artefacts and texts. For example, one view is that no Buddhist image or text should be used commercially, while another view is that if the image has the potential to benefit the minds of living beings, then a commercial context might be acceptable. Since the former view would be acceptable to all traditions, it might be easier for organisers to work from this perspective, and this is what is broadly detailed below. Although it is usually acceptable to include an image of the Buddha or Buddhist symbols on a poster promoting a Buddhist event in a respectful way, it would not be respectful to use an image of Buddha, Bodhisattvas, deities, monks, nuns, teachers, artefact or text for any commercial purpose or purpose other than in keeping with Buddha’s teaching. It would usually be considered offensive to use Buddhist images and texts for wrapping paper, coffee mugs, tea towels, tee shirts and all other commercial uses including licensing. Sometimes a Buddhist organisation will create objects for sale to fund raise, but with an intention of respect and to benefit others. If you are thinking of doing this, it is advisable to work in collaboration with a recognised Buddhist organisation. Location of images – In Southeast Asia, Buddha statues are normally placed in a location removed from ordinary worldly affairs. Other traditions place a Buddha image in a place of prominence as a constant reminder of the importance of Buddhist teaching in all aspects of life. Both traditions are motivated by sincere respect for the teachings, but organisers may need to be aware of the practices relevant to the different traditions. In general any Buddhist image, symbol, artefact or text should not be placed on the floor, walked over, sat on or had secular items placed on top of eg it would not be respectful to place a coffee cup on top of a Buddhist text or image. Temples: in general treat all Buddha images with great respect; do not lean or climb on a Buddha, or point the feet directly at one and remove shoes before entering temple. Meat should not normally be brought into Temple grounds and there should be no photography or video taping without permission. These should not be thrown in a bin, but burned respectfully. If this is not possible, please contact a Buddhist organisation to assist with disposal of the items. There are no access restrictions for lay Buddhists. Many Buddhists are not happy to visit places involved with intentionally harming or exploiting other living beings including animals, the environment, theft, gambling, drink and non-medicinal drug use and other behaviours which go against the practices of the Noble Eightfold Path. In keeping with practices of mindfulness, right livelihood, loving kindness and compassion, Buddhists often support Fair Trade, non-discriminatory, ethical and environmentally caring events. Within these parameters, most lay Buddhists would be happy to visit any venue. If organisers wish access to be available to monks/nuns, they should dialogue with the relevant Buddhist organisations. While there is no precept in the original teaching of Buddha that says that Buddhists have to be vegetarian, many Buddhists are vegetarian, while others are not. In some traditions, monks and nuns must eat their main meal before midday; in other traditions this is not always the case. This relates to the practical realities of the country of origin of a particular school. Some Buddhists have taken the precept to avoid alcohol, others only drink alcohol in moderation while others have not taken any precept at all. In general, vegetarian and non-alcoholic refreshments should be available, and if the event is a religious one, it is a good idea to provide entirely vegetarian, non-alcoholic refreshment. If the event relates to a particular centre or school of Buddhism, or to a particular country, please contact a representative Buddhist Centre of that school for specific advice. There are many Buddhist festivals. Most Buddhists use the Lunar Calendar (except Japanese Buddhist). These vary from country to country and various traditions of Buddhism observe festivals which may be unique to them. Buddhist New Year: depends on the country of origin or ethnic background of the people. Tibetan Buddhist New Year: February to March. Sri Lanka, Burma, Thailand, Laos and Cambodia New Year: three days in the middle of April. Buddha Day: every May on the night of the full moon Buddhists all over the world celebrate the birth, enlightenment and death of the Buddha. The most significant day on the Buddhist calendar. While many Buddhists avoid gambling and participation in any unethical activity, there is no definitive ruling about using sources of funding derived from gambling, so this is left to interpretation. One view is that funding from lottery sources is acceptable provided it is used to benefit others. Other views would prohibit accepting even lottery funding. Many Buddhists would not be happy about knowingly using funding derived from sources involved with killing, stealing or harming others. www.artandbuddhism.org/index.html ‘Awake’ Project (USA) which investigated the relationship between Buddhism and contemporary international arts practitioners, with numerous outcomes including exhibitions and 2 books. www.urthona.com Urthona Magazine (UK) critically explores various perspectives relating to Buddhism and all contemporary arts forms including film, literature, fine arts, performance and photography. www.nbo.org.uk/home.htm ‘Lotus in Flower – Art by Buddhist Artists in the West’ was held in the UK as a national festival by the Network of Buddhist Organisations (NBO) which drew participants of various arts forms from diverse Buddhist traditions. The Heart of Buddha’s Teaching, Thich Nhat Hanh 1998 Parallax Press p 84, reference to Samyukta Agama 785 and Majjhima Nikaya 117, teaching by the Buddha.